In the future Batman muses on the fact that if their plan works this will be the last time he looks at the sun but at the same time if they succeed he will have never seen it in the first place. He gives Superman a key looking object, which will bring Superman back to his own time should their plans fail. Superman, Batman, Nina, Aquaman and the others head into battle only to face Firestorm, who kills Nina. Aquaman tells the others to go on and make sure his sacrifice means something. Superman, Batman and company head to Gotham City where the wellspring that is the source of the Coven's magic is located. Inside Brother Blood is telling the group that their plan is working because he has new memories from when the creature they are going to send back in time arrived to help their past selves in their hour of need. Klarion says that he remembers something as well... a time when a group of petty thieves stole the secret of his people and he will have those secrets returned. Batman saves Superman from being killed but ends up mortally wounded for his sacrifice. 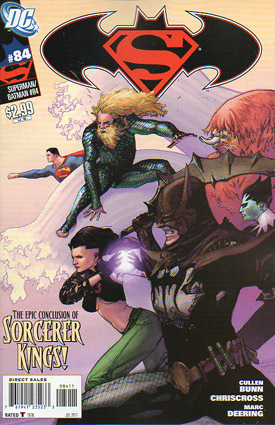 Morgaine unleashes Gargora, the she-beast with a thousand heads and soon the Justice League is faced with a creature that is free to harvest more souls and wreak terror upon mortals and immortals alike. A dying Batman tells Superman to use the key to return to his own time but Superman refuses because Batman brought him to the future to do a job and he isn't backing down now. He takes the sword and uses it to banish Gargora in a spectacular light show. After Gargora disappears Superman wonders why he is still there. Klarion explains that chronomancy is not an exact science. Meanwhile Jason Blood becomes the Demon to kill Morgaine but Superman tells him not to. The Demon tells him that if he wants Morgaine to live he needs to head to the past and fix this. In the present Superman flies in and takes down the would-be Sorcerer Kings with a blast of heat vision backed by the last of the magical power he acquired in the future. His gambit works but Superman is weakened giving Blackbriar Thorn an opening. Batman puts a stop to that with a handy batarang.. The memories of the alternate future start to fade. Superman wonders if he should start carrying a sword. Klarion spots the key that allowed Superman to return to the past and remarks to his cat that they are going to have fun with this. Story - 4: Normally I hate stories that have an alternate future full of dramatic twists and turns that is rendered null and void at the end. I have long felt that it gives the writer the ability to do interesting and sometimes daring things with a character or group of characters without any real repercussions because in the end it never really happened. "Sorcerer Kings" is the exception to that rule and I can't really figure out why. The writing was certainly strong but so was SUPERMAN AND BATMAN: GENERATIONS III and the time bending element of that story just ruined it for me. I think it has a lot to do with the fact that I knew this was going to happen from the beginning and the look we got at alternate takes on characters such as Aquaman and, in this issue, Firestorm was brief. I wasn't allowed all that much time to get overly emotionally invested in those characters. I mean I cared about them, which gave Batman and Aquaman's sacrifices some emotional weight but not enough to be annoyed that in the grand scheme of things they never really existed. The story was short enough that I was able to get in, enjoy it for what it was and get out before my prejudices against this sort of plot had time to kick in. The main strength of this issue for me was Bunn's treatment of Superman. I dug the fact that he wasn't going to escape into the present/past when Batman wanted him to. That, to me, is Superman. Sure he might never see the present day again but a job needed to be done and he was going to do it. It was also pretty cool to see Superman come barreling into the present once the bad guys in the alternate future were taken care of with heat vision blazing. That made me smile. The bit at the end where he briefly considered carrying a sword was a bit much but that was a comedy beat at the end of the story so I can't overly fault it. I do have one question though, which led to me giving this book a four instead of a five. Why didn't Jason Blood become the Demon at the beginning of the fight? It seems to me that he would have come in handy in their final assault. All in all this was a great little story that I fully expected to despise. Cullen Bunn created a magic based super-hero tale full of fantastic guest stars and a group of villains that may have been underused but were a neat grouping of bad guys nonetheless. Klarion was the real surprise of the story because I never really cared for the character before but I was rather fond of Bunn's take on him by the end of the tale. This was one of the better SUPERMAN/BATMAN stories to come down the pike in some time. Art - 4: The art in this issue was just as strong as the writing. The half splash of Superman and Batman on the first page was pretty epic but I equally dug the series of smaller panels underneath. It was neat to see the issue open big and then focus on the more character building panels. This was followed by that fantastic two page splash on the next page (where Superman looked fantastic, by the way) which showed off Chriscross' storytelling abilities and gave the book a real cinematic feel. The expressions of the characters' faces were great as well and showed that these people have personalities and are not just cool looking characters. Chriscross' art was a big part of why I liked this arc and it was great to see the writing and the art come together to make a great comic book story. Cover Art - 3: The cover was the only weak part of the issue for me. It is dynamic on the surface but the characters looks funky, which knocked it down a peg for me.